There was some improvement in form from the Magpie Pool at Rookery Waters last Saturday. Out in front with 59lb 3oz was Mark Pollard. His amazing run of form continued as he cruised to victory putting a net of carp to the scales from peg one catching on bread then red maggot. Second was Tony McGregor, who fished the long pole line with pellet on peg 35 for 29lb 9oz. Third place went to Rob Humphreys with 20lb 9oz. In the Wednesday Over 60s match, also fished on the Magpie Pool, it was sweetcorn king Mick Curtis out in front with 39lb 11oz taken from peg 31. In second place was Bob Coulson on 35lb 6oz, then came Will Hadley with 16lb 10oz. Once again it was tough going for the Webb’s AC lads fishing the Horseshoe Pool at Float Fish Farm Fishery. Leading the way with a modest 12lb 7oz was Andy Matthews. He fished the pole from peg 25 catching most of his fish on red maggot. 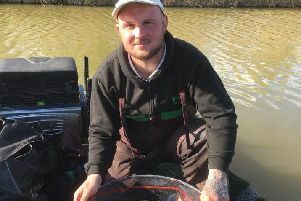 Pawel Firka fishing his first ever match in the UK did really well to take the runner-up spot. The Polish lad caught on a small feeder from peg one, again on red maggot to weigh in 11lb 10oz. Third place went to Gordon Harmer on 9lb 5oz. The Wednesday Over 55s match at Float Fish Farm on the Horseshoe Pool was a ‘blind pairs’ event so no one knew who their partner was until after the weigh-in. Dave Langstone and Dave Marzell topped the field with a combined weight of 77lb 10oz. Stan Dow and Bob McBeath weighed in 60lb 15oz to take the runner-up spot.